Bob Reilly takes on neo-conservative Middle East expert Reuel Marc Gerecht in today's Wall Street Journal. Reilly points out that a presupposition of democracy is solution of the religious issue--that is, freedom of conscience. That is, the American model remains the most reasonable means of establishing democratic self-government. UPDATE: The Reilly letter in op-ed form. First, they came for the Puerto Ricans. The HHS mandate requiring sterilization and birth control coverage in health insurance was anticipated in the New Deal policy toward Puerto Rico. It is now plain how New Deal and successive leftist social engineering embraces all aspects of political, commercial, and family life. The recent Republican presidential primary in Puerto Rico drew attention to this constitutional oddity--a commonwealth/colony of American citizens. But the contenders overlooked the most significant element of recent Puerto Rican history for American politics today. Franklin Roosevelt appointed one of the architects of the New Deal, Rexford G. Tugwell as its Governor. Serving from 1941-46, Tugwell followed Progressive ideology and transformed the University of Puerto Rico into a think-tank for liberal reforms for the island. He established a decades-long practice of using Puerto Rico as a laboratory for liberal policies, including birth control through sterilization and the pill. According to one historian (JSTOR link), heavily Catholic "Puerto Rico became the chief testing ground for the birth control pill." For a while more women were sterilized there than in any other country in the world. These population control measures, tied with economic reforms, were intended to make Puerto Rico a "showcase for democracy" in the Cold War, a model of enlightened policy toward developing nations. Bored by their lack of progress, scholars of Puerto Rico such as Oscar Lewis (author of the classic study La Vida) turned instead to that more exciting example of Cuba. We don't need West Side Story to know that Puerto Ricans "like to be in America." But what happens when America becomes another Puerto Rico? Who Does the New York Times Hate? Ridiculing the New York Times for liberal bias would prove a full time job, so I generally only venture into that fertile field when the example is particularly egregious. One of those occasions occurred today. The Times published a full page ad from the Freedom From Religion Foundation which viciously slurs the Catholic Church and openly calls for Catholics to leave the Church. 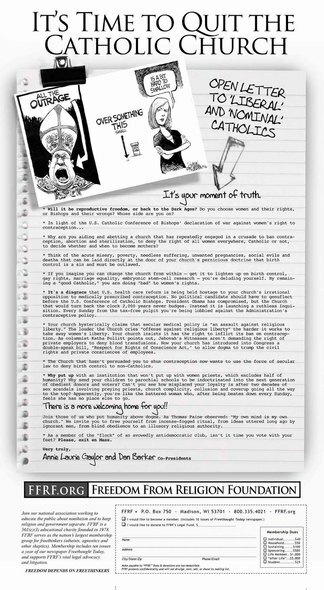 Never has there been a more vicious anti-Catholic advertisement in a prominent American newspaper than the one in today's New York Times by Freedom From Religion Foundation (FFRF). FFRF is a vitriolic, militant and litigious atheist group with very little tolerance and even less good taste or class. They are of no real interest in this matter, of course - it's not difficult to find a small coterie of hate-filled vermin under any given rock. The issue is that the Times has handed them a microphone. Try to imagine a similar ad aimed at Muslims - or attacking atheists - and imagine the reaction of the New York Times - and the liberal disciples of tolerance who are suspiciously quiet in the wake of this obvious expression of hate and intolerance. This article challenges the conventional understanding of the separation of church and state by arguing that there is no analytical or constitutional problem with using religious law for the purpose of constitutional interpretation. We situate our arguments within the context of the broader debate on the use of foreign law in constitutional interpretation, and the more recent controversy surrounding the proposed bans on the use of religious law in U.S. state courts. By examining the arguments for and against the use of foreign law, we show how they equally apply to the use of religious law. More importantly, we conclude that differences between foreign law and religious law are, at best, differences of degree rather than kind, and thus do not militate against the use of religious law in constitutional interpretation. The article demonstrates that religious law can be used, and in fact, has already been used by the Supreme Court for four limited purposes, none of which, we argue, offends the principles underlying the Establishment Clause. The ultimate import of our claim is not that religious law should be used by courts, but that recognizing its potential as a source in constitutional interpretation should result in a deeper and more careful engagement with the possibilities it generates. The U.S. Constitution is a common law document and the common law is founded upon ancient custom, natural law and right reason. As such, natural law would seem to be a logical and legitimate source by which to interpret the U.S. Constitution - and religious law would seem to be a promising guide by which to discover the natural law. However, entrusting judges with the authority to scrutinize religious law and decipher the natural law seems to be nothing more than conservative rhetoric for the adoption of a "living constitution." Furthermore, the authors - who seem to favor the adoption of foreign law in U.S. courts - are not likely contemplating Catholic canon law or Jewish Halakha, but rather Islamic Sharia law. Those who might feel inclined to sympathy toward the use of religious law in U.S. courts should consider well which religious law will be employed and the likelihood that religious law would be subverted to bolster progressive ends which will prove anathema to those of faith. Insofar as religious law - and religion itself - historically cultivated American law, it is a relevant and proper guide to the interpretation of the original meaning of the constitution's text. But as a persuasive authority to which judges may turn for inspiration in updating an evolving constitution, religious law is no less dangerous than French law. When Obama decided to attack Catholics (and religion, in general) by forcing a contraception, sterilization and abortion insurance mandate on private institution, a question arose: Did he not foresee the backlash, or was the goal of subjecting conservative religion to liberal feminism so great that it was worth the fight? I tend to assume the latter - Obama has proved a classless and spiteful president who has consistently demeaned the office by lashing out at private individuals and institutions who dare disagree with his ideology (e.g., the Koch brothers). The issue is multi-dimensional and profound in relation to both political theory and practical consequence. On the former, see the Conference of Catholic Bishops' website, which declares absolute opposition to the president's violation of "conscience rights and religious liberty." According to Cardinal Timothy Dolan, president of the USCCB, "Never before has the federal government forced individuals and organizations to go out into the marketplace and buy a product that violates their conscience. This shouldn't happen in a land where free exercise of religion ranks first in the Bill of Rights." As to the practical consequences, Ed Morrisey at Hot Air asks, "What if Catholic bishops aren't bluffing?" Earlier this week, Francis Cardinal George of the archdiocese of Chicago sent a message to parishioners in Barack Obama's home town that imposition of the HHS mandate to fund and facilitate contraception, abortifacients, and sterilization would force the Catholic Church to close its hospitals, clinics, schools, and all other organizations that would otherwise have to comply. "Two Lents from now," Cardinal George warned, "unless something changes, the page [listing Catholic organizations] will be blank." At the time, some commenters wrote that this has been Obama's plan all along -- to force religious charities out of business to make people more dependent on government. Others, including myself, figure that Obama just thinks the bishops are bluffing, and wants to engage in a high-stakes bout of brinksmanship to force them to kneel to secular authority over doctrine. The Catholic Church has perhaps the most extensive private health-care delivery system in the nation. It operates 12.6 percent of hospitals in the U.S., according to the Catholic Health Association of the U.S., accounting for 15.6 percent of all admissions and 14.5 percent of all hospital expenses, a total for Catholic hospitals in 2010 of $98.6 billion. Whom do these hospitals serve? Catholic hospitals handle more than their share of Medicare (16.6 percent) and Medicaid (13.65) discharges, meaning that more than one in six seniors and disabled patients get attention from these hospitals, and more than one in every eight low-income patients as well. Almost a third (32 percent) of these hospitals are located in rural areas, where patients usually have few other options for care. This is a case of clear principles: a vote for Barack Obama in November is a vote against religious liberty and accessible health care in America. All men of good will and sound judgement should ensure that he does not have the opportunity to erode America's sacred liberties and public services any further.